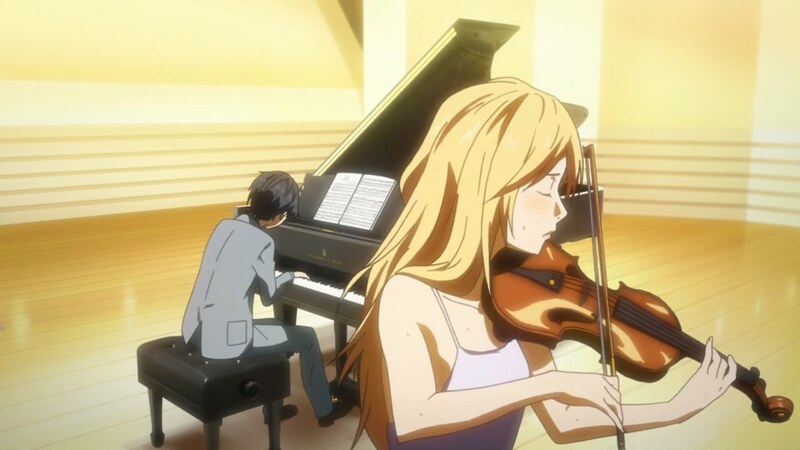 There wasn’t much music in the previous episode of Shigatsu wa Kimi no Uso aside from the Mozart lullaby, but it did preview the work that would be given its grand showcasing in episode 4: the “Introduction and Rondo Capriccioso” by Camille Saint-Saens. The first thing you’ll notice from the video is that, unlike the Beethoven “Kreutzer” Violin Sonata in episode 2 which uses a violin-piano pairing, Saint-Saens’s “Introduction and Rondo Capriccioso” was made for violin and orchestra. Bringing a full-blown orchestra to a violin competition is impractical though. For smaller competitions like the one Kaori is taking part in, performers will be accompanied by a pianist who takes on the role of the orchestra. On the day of Kaori’s performance, Kousei takes on that accompaniment role. Near the start of the performance, Kousei noted that Camille Saint-Saens had dedicated this piece to the virtuoso violinist Pablo Sarasate. At the time, Sarasate was a mere 19 years old, but had already established a reputation as a violinist who could unleash pure-sounding tones and display awe-inspiring technique. Both of these traits fit in with Saint-Saens’s compositional flair, so when Sarasate came to Saint-Saens requesting that Saint-Saens compose a piece for him, Saint-Saens was more than happy to oblige. The result is an extroverted piece in which the performer could dazzle audiences. With that thought in mind, it’s interesting to see how the piece is laid out. The first section, the Introduction, is marked by a lovely, plaintive violin melody that is neither flashy nor exuberant. That section lasts for a whole 90 seconds before the expressiveness of the Rondo Capriccioso rides in like a storm, guided by the violinist’s virtuosic hand. Kaori’s hand in the Introduction is definitely softer and more subdued than Isaac Stern’s. Her lead-in doesn’t have quite as much bite, which leads to one of the judges noting that her performance sounds “docile”. But that’s quickly erased as she approaches the middle of the Introduction where her violin jumps with aplomb, then returns to its plaintive roots, repeating once more before moving elegantly into the Rondo Capriccioso. Of course, it’s in the Rondo Capriccioso where things fall apart once Kousei’s memories of his mother cause him to lose it altogether. And that’s too bad too because this is where the violinist gets to show off. 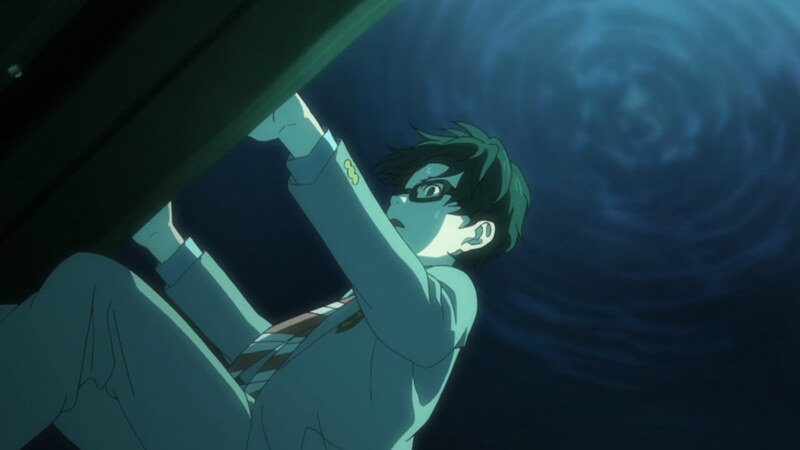 In the anime’s rendition, Kousei fumbles around the part heard beginning in 2:16 in the video. The resulting discordance is painful as Kaori and Kousei go out of sync. Because of the clash in the accompaniment, you miss out on Kaori’s violin flutters and subsequent slashes which would have been a treat to see. What makes it worse is at the point where Kousei is supposed to take over the melody (see 3:27 in the video), he completely unravels and grinds to a halt. Kaori continues playing (to 4:14), but also stops shortly after. But with those bright eyes and a can-do outlook, Kaori resumes. She picks up where she leaves off, reaches the section where the melody uses two strings, starts slashing away with cool confidence, and ratchets down. Kousei rouses himself from his self-pity and finds the courage to play. Together, the two reprise the start of the Rondo Capriccioso where, as the judge remarks, they’re still out of sync, but things progress nonetheless. 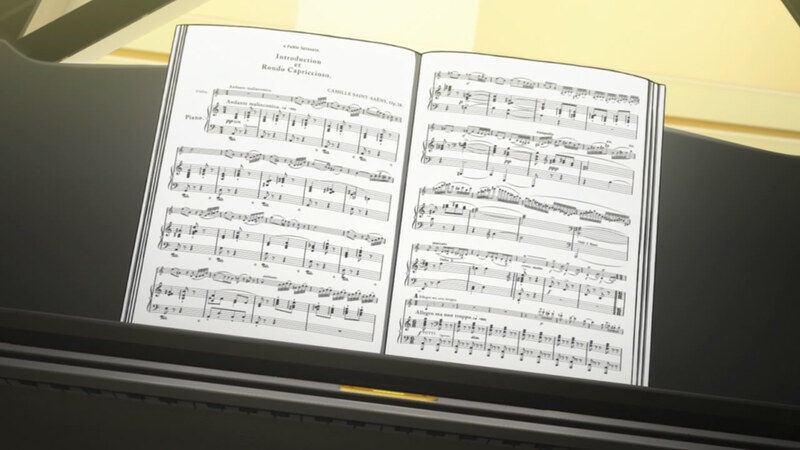 Though they skip over some of the sections, I was pleased the anime included the point where the Rondo Capriccioso’s motif shifts to the major key (see 6:41) and the violinist moves along at a jaunty pace. It’s at 7:13 where Kousei finally takes command. In the rendition with Isaac Stern, the orchestra lets the violinist take the lead by going on a softer road, but Kousei opts, nay demands, to be as important as Kaori. This leads to what the judge describes as a “brawl”, but keeps the audience riveted with the dazzling display, earning Kaori and Kousei a standing ovation and loud plaudits. It wasn’t the most canon performance (to the consternation of the judges) and the accompaniment might have eclipsed the soloist too much towards the end (possibly to Saint-Saens’s consternation), but the listeners’ (in this case, the audiences’) opinion is what counts most. Interesting write up as always; cool to know some of the history behind the pieces and how that fits in with what is going on in the anime. Glad you’re able to get a lot out of it. And yeah, I’m pretty behind. Will take awhile to catch up, especially with all that Chopin!